Hi there! Do you know the shape of the Moon? You say yes of course! But up to which accuracy? The surface of the Moon has many irregularities, which prompted Christian Hirt and Michael Kuhn to study the limits of the mathematics, in modeling the shape of the Moon. Their study, entitled Convergence and divergence in spherical harmonic series of the gravitational field generated by high-resolution planetary topography — A case study for the Moon, has recently been accepted for publication in Journal of Geophysical Research: Planets. If you look at a planetary body from far away (look at a star, look at Jupiter,…), you just see a point mass. If you get closer, you would see a sphere, if the body is not too small. Small bodies, let us say smaller than 100 km, can have any shape (may I call them potatoids?) If they are larger, the material almost arranges as a sphere, which gives the same gravity field as the point mass, provided you are out of the body. But if you look closer, you would see some polar flattening, due to the rotation of the body. And for planetary satellites, you also have an equatorial ellipticity, the longest axis pointing to the parent planet. Well, in that case, you have a triaxial ellipsoid. You can say that the sphere is a degree 0 approximation of the shape, and that the triaxial ellipsoid is a degree 2 approximation… but still an approximation. A planetary body has some relief, mountains, basins… there are explanations for that, you can have, or have had, tectonic activity, basins may have been created by impacts, you can have mass anomalies in the interior, etc. This means that the planetary body you consider (in our example, the Moon), is not exactly a triaxial ellipsoid. Being more accurate than that becomes complicated. A way to do it is with successive approximations, in the same way I presented you: first a sphere, then a triaxial ellipsoid, then something else… but when do you stop? And can you stop, i.e. does your approximation converge? This study addresses this problem. This problem is pretty easy when you are far enough from the body. You just see it as a sphere, or an ellipsoid, since you do not have enough resolution to consider the irregularities in the topography… by the way, I am tempted to make a confusion between topography and gravity. The gravity field is the way the mass of your body will affect the trajectory of the body with which it interacts, i.e. the Earth, Lunar spacecrafts… If you are close enough, you will be sensitive to the mass distribution in the body, which is of course linked to the topography. So, the two notions are correlated, but not fully, since the gravity is more sensitive to the interior. But let us go back to this problem of distance. If you are far enough, no problem. The Moon is either a sphere, or a triaxial ellipsoid. If you get closer, you should be more accurate. And if you are too close, then you cannot be accurate enough. This limit is given by the radius of the Brillouin sphere. Named after the French-born American physicist Léon Brillouin, this is the circumscribing sphere of the body. If your planetary body is spherical, then it exactly fills its Brillouin sphere, and this problem is trivial… If you are a potatoidal asteroid, then your volume will be only a fraction of this sphere, and you can imagine having a spacecraft inside this sphere. 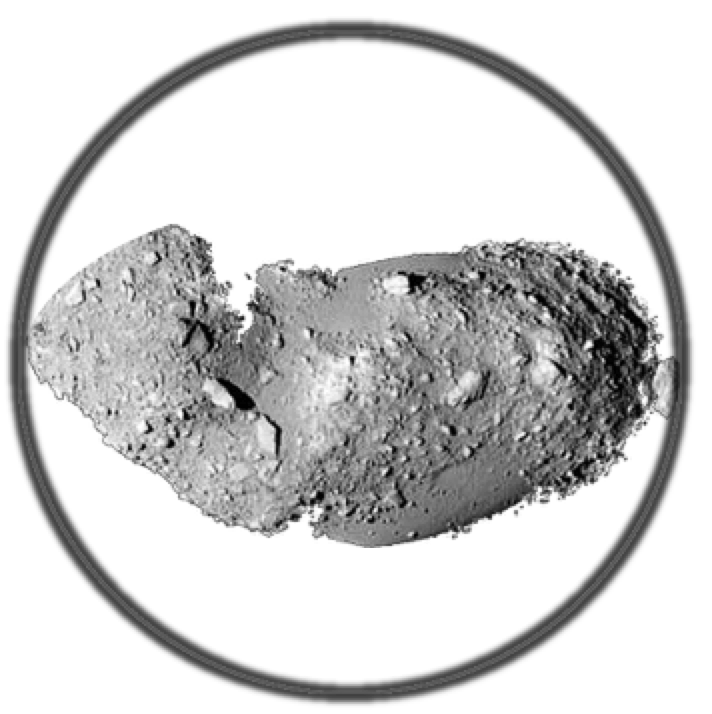 The asteroid Itokawa in its Brillouin-sphere. Credit: JAXA. The Moon is actually pretty close to a sphere, of radius 1737.4±1 km. But many mass anomalies have been detected, which makes its gravity field not that close to the one of the sphere, and you can be inside the equivalent Brillouin sphere (if we translate gravity into topography), in flying over the surface at low altitude. The goal of the paper is actually not to find something new on the Moon, but to test different models of topography and gravity fields, before using them on other bodies. Usually the gravity field (and the topography) is described as a spherical harmonics expansion, i.e. you model your body as a sum of waves with increasing frequencies, over two angles, which are the latitude and the longitude. This is why the order 0 is the exact sphere, the order 2 is the triaxial ellipsoid… and in raising the order, you introduce more and more peaks and depressions in your shape… In summing them, you should have the gravity field of your body… if your series converge. It is usually assume that you converge outside the Brillouin sphere… It is not that clear inside. To test the convergence, you need to measure a distance between your series and something else, that you judge relevant. It could be an alternative gravitational model, or just the next approximation of the series. And to measure the distance, a common unit is the gal, which is an acceleration of 1 cm/s2 (you agree that gravity gives acceleration?). In this paper, the authors checked differences at the level of the μgal, i.e. 1 gal divided by 1 million. “GRAIL-sphere”, at a mean altitude of 23 km. In each of these cases, the authors used series of spherical harmonics of orders between 90 (required spatial resolution: 60.6 km) and 2,160 (resolution: 2.5 km). In each case, the solution with spherical harmonics was compared with a direct integration of the potential of the body, for which the topography is discretized through an ensemble of regularly-shaped elements. A minimum in the degree variances of an external potential model foreshadows divergence of the spherical harmonic series expansions at points inside the Brillouin-sphere. My feeling is that this study should be seen as a laboratory test of a mathematical method, i.e. testing the convergence of the spherical harmonics expansion, not on a piece of paper, but in modeling a real body, with real data. I wonder how the consideration of time variations of the potential would affect these calculations. The study, made freely available by the authors on ResearchGate and here. You can find an electronic (Matlab) version of the models here. Thanks to the authors for sharing! The one of Michael Kuhn.